The Best of BCS, Year Seven features such authors as K.J. Parker, Carrie Vaughn, Yoon Ha Lee, Aliette de Bodard, Richard Parks, and Gemma Files, Rich Larson, and Fran Wilde. It includes “The Punctuality Machine, Or, A Steampunk Libretto” by Bill Powell, a finalist for the Parsec Awards, and “Grandmother-nai-Leylit’s Cloth of Winds” by Rose Lemberg, a finalist for the Nebula Awards. 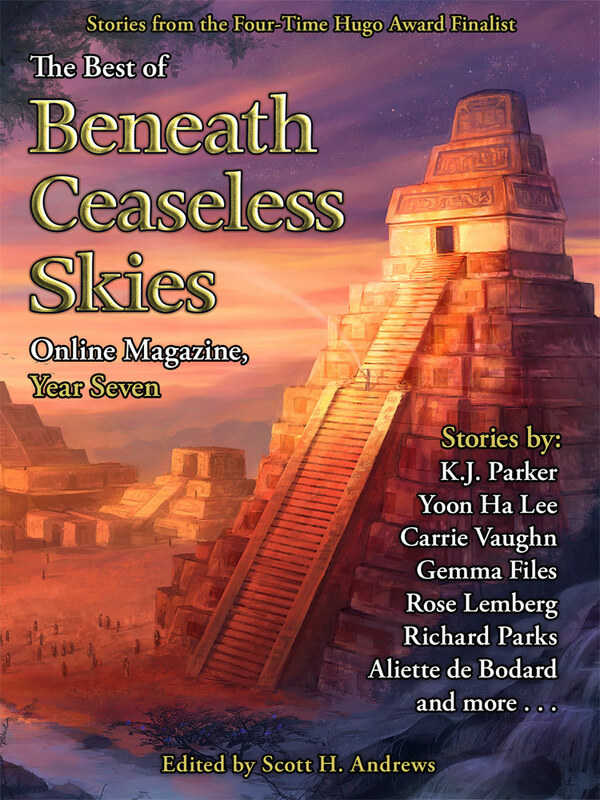 The Best of Beneath Ceaseless Skies Online Magazine, Year Seven will be available in September for only $3.99 from major ebook retailers including Kindle, Barnes & Noble, iTunes/iBooks, Kobo, WeightlessBooks.com, and more. All proceeds from the sale of The Best of BCS, Year Seven go to pay BCS authors and artists for their work. Buy a copy to read great literary adventure fantasy and support Beneath Ceaseless Skies.